You know how some sitcoms will do the flashback episode, where it’s about 5 minutes of new material, a few shots of them saying “remember…” and a bunch of clips from previous episodes. I hated those episodes. I still watched them, and probably laughed, but I thought it was a cop out. This post is kind of like one of those episodes. 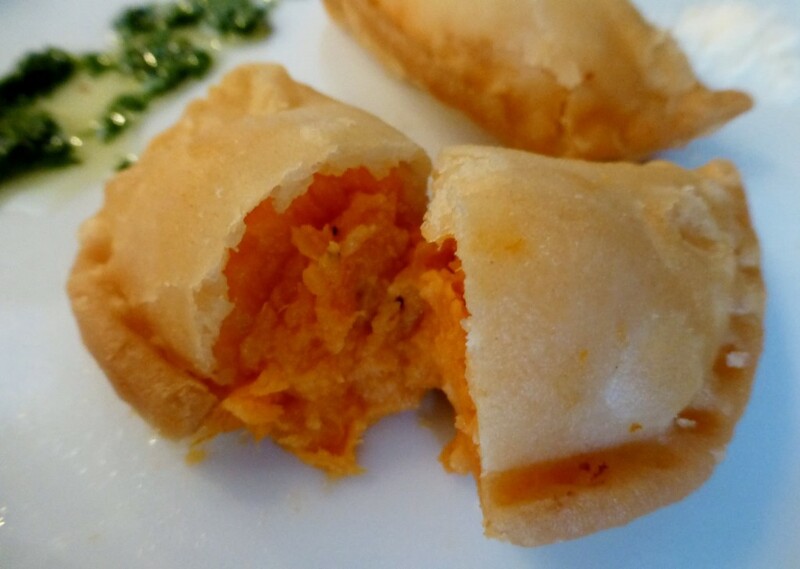 I’ve already posted recipes for empanadas and sweet potato mash. This recipe adds the two together along with some cotija. 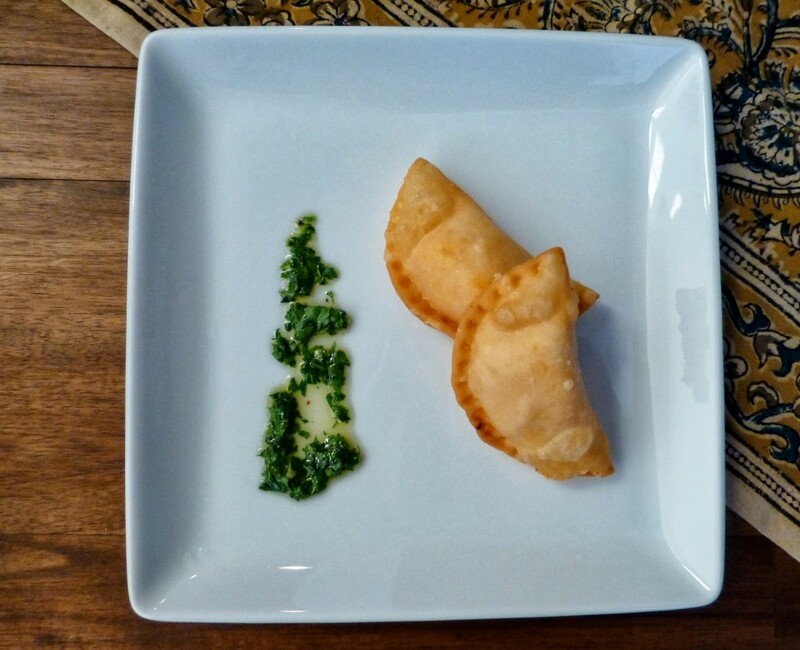 It also revamps the chimichurri recipe, though, and shows a different technique to roll out the empanada, the ravioli technique, which I actually already posted. Remember these ladies? And their doily hats? 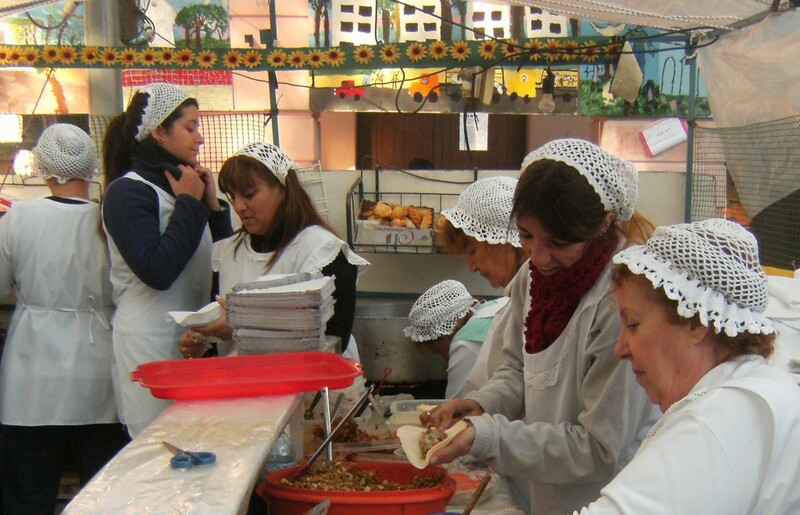 I spent most of my time at that gaucho market, watching them roll, fill, and fry empanadas. It was probably to the point of being a slightly creepy tourist, but I wanted to figure out how to do it! It might seem like a lot of work, but it’s not really. Make some sweet potato mash for dinner one night, and make a little extra and refrigerate it. That same night make a batch of pie dough and put it in the fridge. Mixing pie dough in a food processor is pretty fast. It probably takes longer to clean the processor afterwards then it does to actually make the dough. Then the next day, you can roll and fill them. And when you have extra empanadas, freeze them (uncooked), for an easy meal some other night. 1. 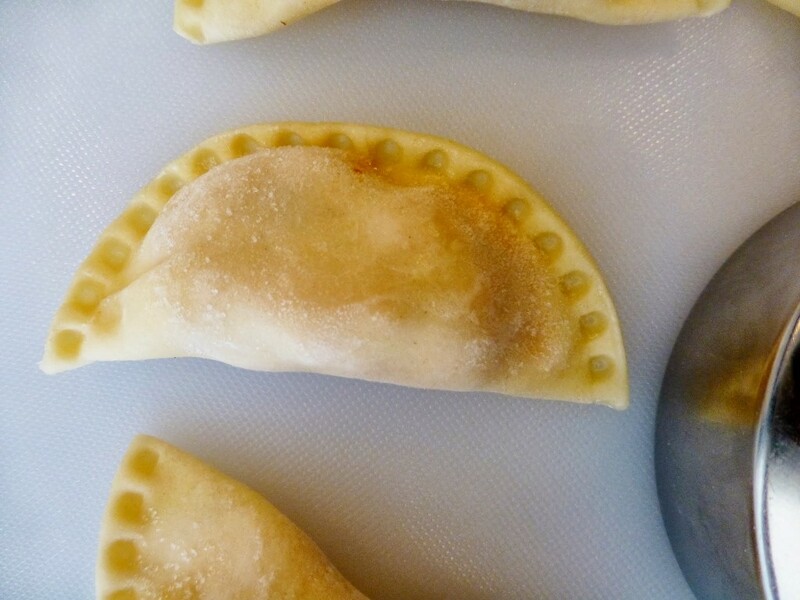 If you have a pasta machine, use the ravioli method to roll and cut out the dough. If not, use the same method as I posted previously. The pasta machine is a quicker way and produces more uniform results. 2. Mix the sweet potato purée with the cotija cheese. 3. Spoon in about 1-2 T of cooled sweet potato purée for a 3 in wide empanada. 4. If baking them, brush with an egg wash (1 egg + 1 T water). 5. Bake (for 40-55 min) or fry in oil (3-5 min), either way at 350˚. 1. In a food processor, pulse together the parsley, garlic, and lemon zest. 2. Add in the chile flakes, salt, and red wine vinegar and pulse a couple more times. 3. Then pour in the oil. If you want it thinner or less potent, add in some water (room temp). 4. Transfer to a jar and refrigerate overnight. Let it come to room temperature before using.